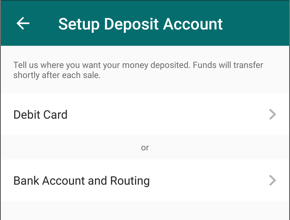 When you get a cashless payment through OfferUp, we'll deposit it to your debit card or bank account. Sorry, prepaid debit cards won’t work for deposits. You must provide your deposit information within 90 days of a sale. 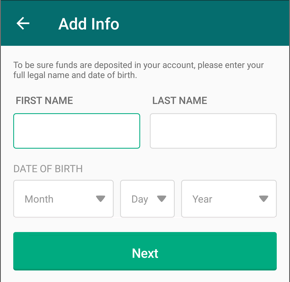 If you don't have a deposit account yet when you get your first payment, you’ll get a notification asking you to add your information. Tap it to continue. 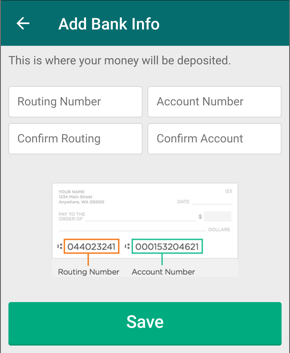 You can also go to Account, tap Payments and receipts, then Add Deposit Account. If you've received a payment and have a balance waiting, tapping Cash out will prompt you to add a deposit account first. Your balance will be transferred to your account afterward. Tell us where you want your money deposited. You can use your Debit Card information or your Bank Account and Routing numbers. 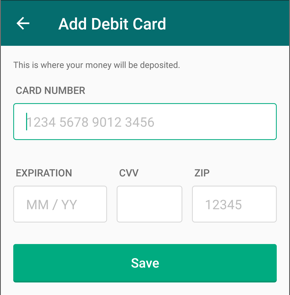 If you’re entering debit card info, add your card information, then tap Save. If you’re entering bank information, get routing and account numbers from the physical checks issued by your bank. The app will show you where to find these numbers on your checks. If you don’t have paper checks handy, log into your bank account online or contact your bank to confirm the numbers. Enter both numbers twice to make sure they’re right. Then tap Save. Your deposit information can be managed under Account and Payments and receipts.